Direct from Florida's sun-drenched beaches, this very fun Sterling silver bangle is sure to bring a little sunshine and warmth to it's wearer! Created in bright, beautiful tropical hues of lime green and light blues, Kelly Dunagan's gorgeous lampwork captures the laid back, tropic feel of our beautiful Treasure Coast. A whimsical little thong sandal and octopus beads are perfect accents! 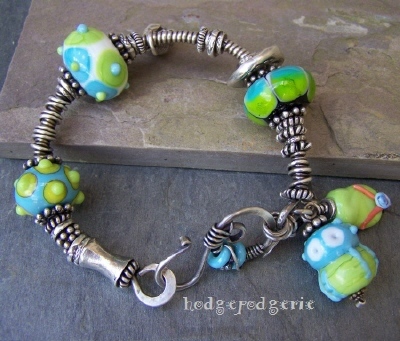 The largest of these BIG lampwork beads is 22mm in diameter, excluding the dots! I've wound Sterling silver wire around a heavy gauge core and added lots of spacers. 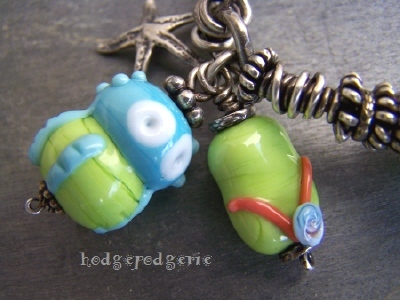 Charming silver sea creatures complement the lampwork's beachy feel. A patina and soft brushed finish, along with my own handmade hammered wiredoodle clasp, further enhances its eclectic handcrafted look. 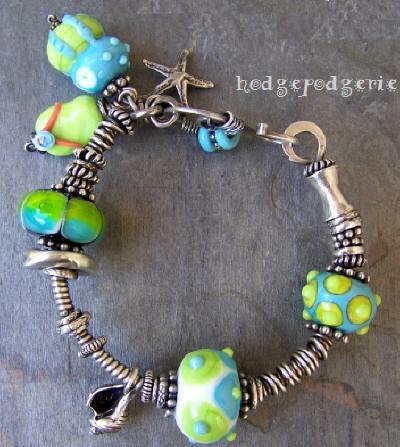 Return from "Beach Fun Bangle" page to "Bangle Gallery" page.